With copper prices prevailing at unprecedented high levels in 2006, a copper manufacturer in India was struggling to improve the metal yield in Smelter, which averaged below 90%, with the best achieved in any month over past 10 years being just 91%, compared to global norms of 93 to 95%. The company not only had the disadvantage of running very old machinery, with relatively low capacity of the plant, but also had to manage with ageing workforce which, though highly experienced, had low education & lacked motivation to change. 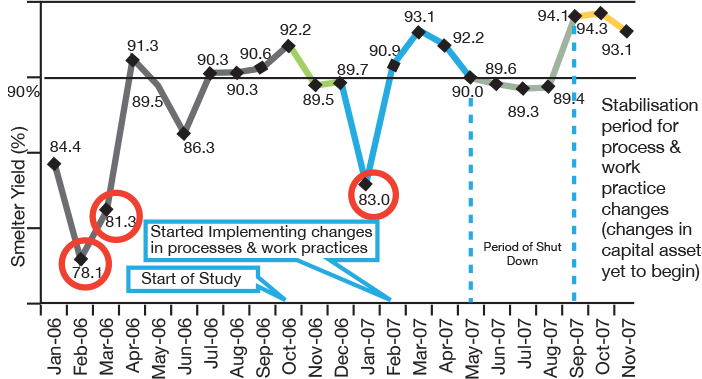 After a preliminary study, the consultants of Actuate Business felt a compelling need to enthuse & involve all employees in the improvement initiative which was bound to question many established beliefs and work practices. Hence it was proposed & agreed by the company management to train its employees in tools & techniques of Six Sigma. Awareness training programs were conducted across different hierarchical levels to cover not only the managers & supervisors but also key workers & union representatives to make the change initiative all inclusive. Subsequently, a select group of 20 was imparted detailed training in DMAIC methodology of Six Sigma. The trained personnel were helped & guided to identify and undertake group projects to achieve Smelter yield of more than 93%. Two most important factors that affected Smelter yield and therefore formed the leading projects, were ‘Net Revert Generation’ and ‘Copper Loss in Slag’. Each project was defined in detail using Critical to Quality (CTQ) map. Project Charters were prepared and agreed with management. Data was analysed using Cause & Effect diagrams to identify root causes of the problem. Brainstorming & other techniques were used to evolve improvement / change proposals. Presentations were made to management seeking approval before starting implementation of changes in process, operating methods & work practices, though implementation of capital asset changes was deferred for a year. Results exceeded expectations with Smelter yield averaging over 94%.